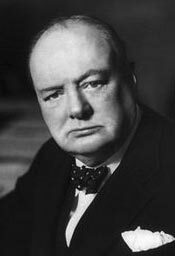 Winston Churchill (1874-1965) was the prime minister of Great Britain for much of World War II and then again between October 1951 and April 1955. Churchill is remembered as one of the architects of the Cold War, particularly his firm opposition to Stalinism and his coining of the phrase “Iron Curtain” to describe the Soviet grip on eastern Europe. According to some historians his inflammatory and provocative remarks further widened the divisions between East and West. Winston Churchill was born into a British aristocratic family, the son of Lord Randolph Churchill and his American-born wife Jeanette. As a young boy he was raised and educated mainly by nannies, who found him rebellious, stubborn and a poor student. Churchill was later schooled at Harrow, where he excelled at writing and history but little else. He attended Sandhurst military college in 1893-94, training as a cavalry officer and obtaining a lieutenant’s commission. He remained in the army for several years, serving in various locations abroad while also working as a newspaper correspondent. Churchill entered the British parliament in 1900, winning the seat of Oldham and aligning himself with the Conservative Party. In 1911 he was appointed First Lord of the Admiralty. In this role, he became a leading figure in the failed Dardanelles or Gallipoli campaign during World War I. Churchill moved in and out of the public eye thereafter, serving as Chancellor of the Exchequer but spending several years as a backbencher. During the 1930s he urged strong action against Nazi Germany, at a time when many in the British government were seeking to appease Adolf Hitler and his regime. When World War II erupted in September 1939 Churchill was again appointed First Lord of the Admiralty. His revived credibility and public popularity led to Churchill becoming prime minister in May 1940, after the resignation of Neville Chamberlain. History will best remember Churchill for his management of the British war effort, at a time when the nation at risk of a Nazi invasion. He became famous for his public appearances, his belligerent and forceful rhetoric and his ‘V for victory’ salute. During the war, Churchill formed a close working alliance with United States president Franklin Roosevelt. His relationship with Soviet leader Joseph Stalin, however, was more cautious and measured. A staunch anti-communist, Churchill was prepared to negotiate with Stalin on the conduct of the war – but he harboured concerns about Stalin’s motives and post-war intentions. By 1944 Soviet troops were beginning to push into Nazi-occupied eastern Europe. Churchill feared they would remain there after the war. At the Yalta conference in early 1945, Churchill agreed to the Soviet occupation of eastern Europe, provided Stalin agreed to allow Polish independence and free elections. Stalin agreed and Churchill accepted his promise, though it was later broken. Churchill later attended the Potsdam conference (July 1945) but was replaced halfway through, after losing a general election at home. He became leader of the opposition, a position he held for six years, and continued to rally opposition against Soviet expansionism. 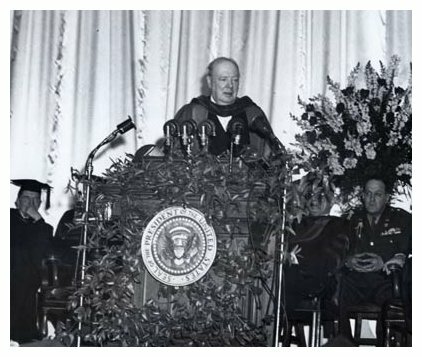 In 1946 Churchill, while addressing an audience at Westminster College in Missouri, famously warned that “an iron curtain” was descending on Europe. Churchill was returned to the prime ministership after winning a general election in October 1951. Much of this term was spent managing Britain’s post-war reconstruction and domestic policies. Churchill also maintained Cold War policies, consolidating the Anglo-American alliance and strengthening Britain’s intelligence agencies to deal with suspected Soviet agents. Churchill was particularly fearful of a nuclear arms race, so urged US president Dwight Eisenhower to negotiate arms limitations with Moscow. Age and poor health took their toll on Churchill and he resigned the prime ministership in April 1955, six months after his 80th birthday. He remained in parliament until October 1964 and died in January 1965, aged 90. J. Llewellyn & S. Thompson, “Winston Churchill”, Alpha History, accessed [today’s date], https://alphahistory.com/coldwar/winston-churchill/.